Monte Calvert, far right, seen here as a college newspaper editor, had a life-long interest in the history of American mechanical engineering and a deep fascination with typewriters. 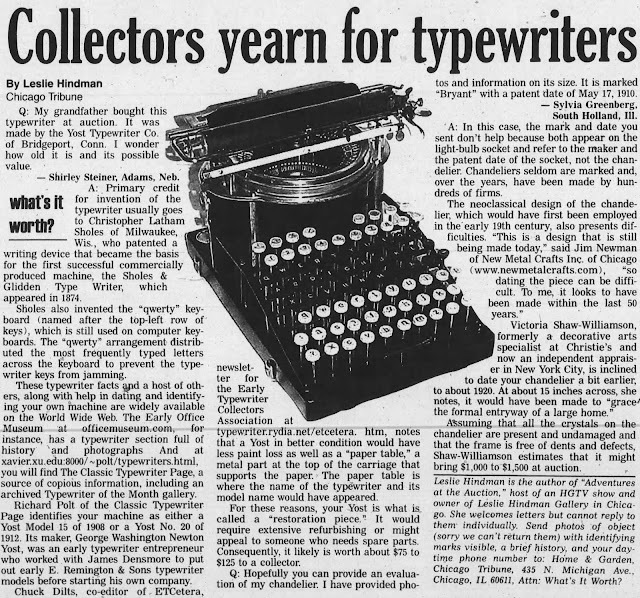 About the time The New York Times' arts, antiques and auctions columnist Rita Reif declared, on July 21, 1973, that "this is the year when old [typewriters] have been transformed from disposables into collectibles", mechanical engineering historian Monte Alan Calvert had put together a contact list of typewriter collectors across the United States. 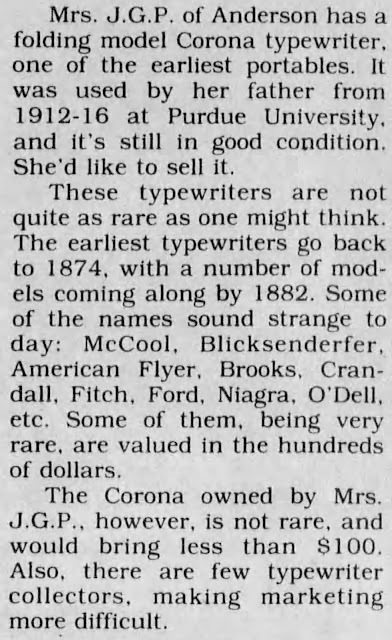 Reif was herself a trailblazer, as her New York Times antiques and auctions articles inspired many others - such as Ralph and Terry Kovel, Lynn Hopper, Lita Solis-Cohen, Ann McCutchan, Leslie Hindman, Anne Gilbert and Anita Gold - to syndicate newspaper columns containing advice for a burgeoning population of antiques collectors across the country. 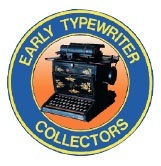 These proved an enormous boon for typewriter collecting, right through to the early 2000s, and initially were a very valuable vehicle for the like of Darryl Rehr, Dan Post, Don Sutherland and Paul Lippman to promote their expertise and their collections, and later to publicise the existence of a more formal organisation for typewriter collectors. 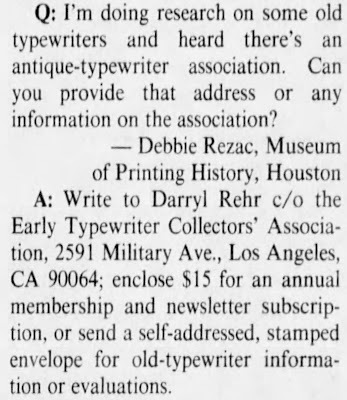 Espousing the idea that these collectors and historians were "official" advisers and contact points, the antiques columnists served the typewriter collecting community extremely well. More localised publicity for this "new" interest began in September 1972 with Calvert. It started to reach a national audience with Reif in July 1973. Reif mentioned that Calvert, then based in Potsdam, New York, and teaching the history of technology at Clarkson College there, had since January 1973 been in touch with as many as 50 collectors, to form "the country's only society of typewriter collectors", an informal group with no name. 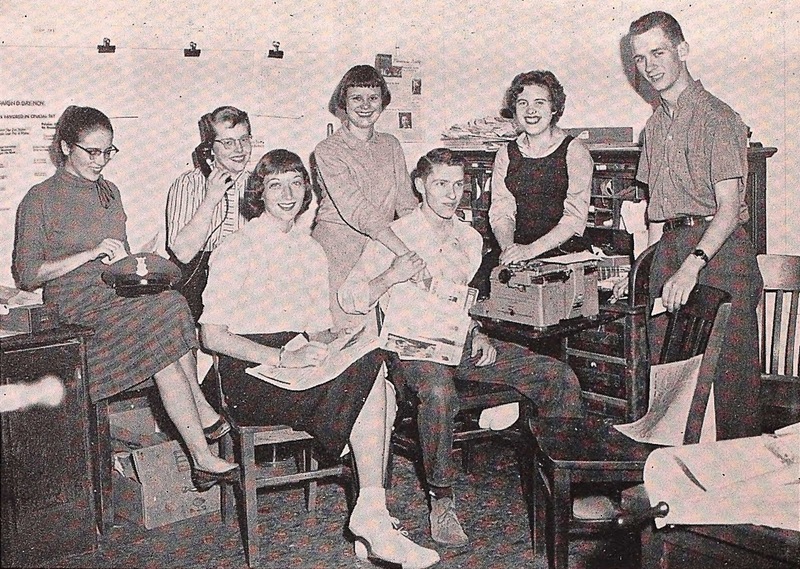 It would be another 14 years before a formal group with a name would be established, under the presidency of Jim Lacy (right): the still vibrant Early Typewriter Collectors' Association. 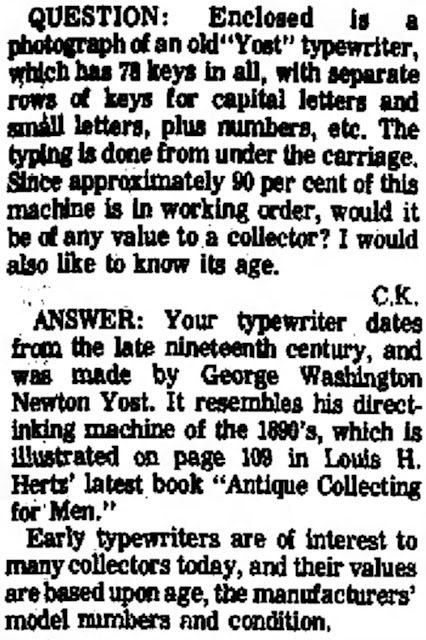 By which time Calvert's early contribution to a collective of typewriter collectors had all but been forgotten. being gathered by the University of Pittsburgh. 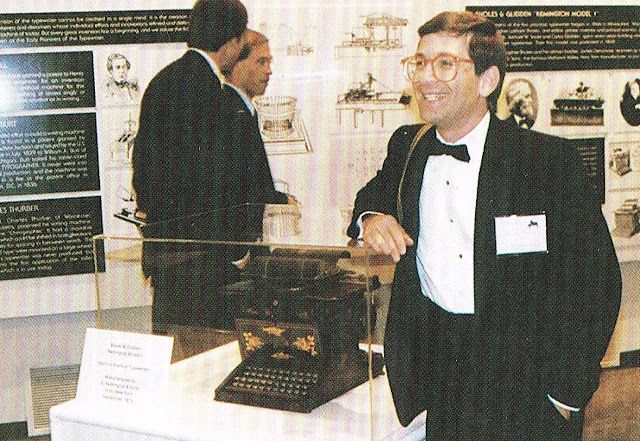 Paul Lippman with some of his typewriters. Calvert, who also taught technology and engineering at the University of Delaware in the early 1960s, is best known today as the author of the much-referenced work The Mechanical Engineer in America, 1830-1910, published in 1967, in which he defined the differences between "shop culture" and "school culture" and the conflict between them. (He also wrote American Technology at World Fairs, 1851-1876 in 1962 and The Abolition Society of Delaware, 1801-1807 in 1963.) 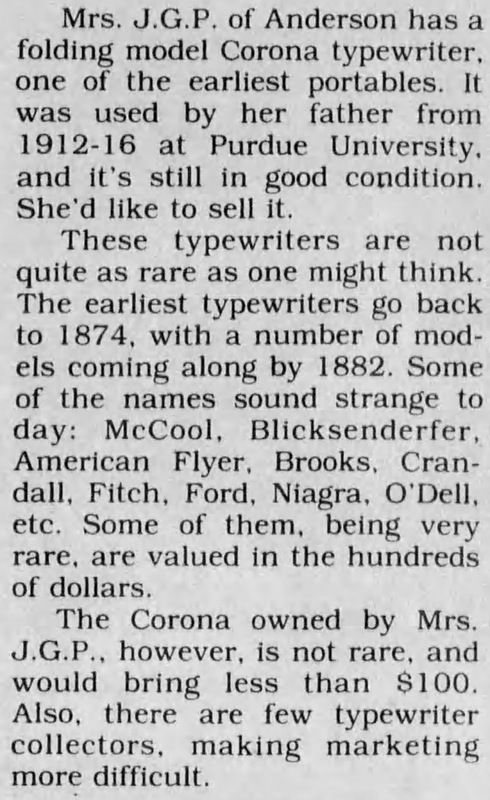 By 1972 he was talking knowledgeably about typewriter history and displaying the pick of his collection. 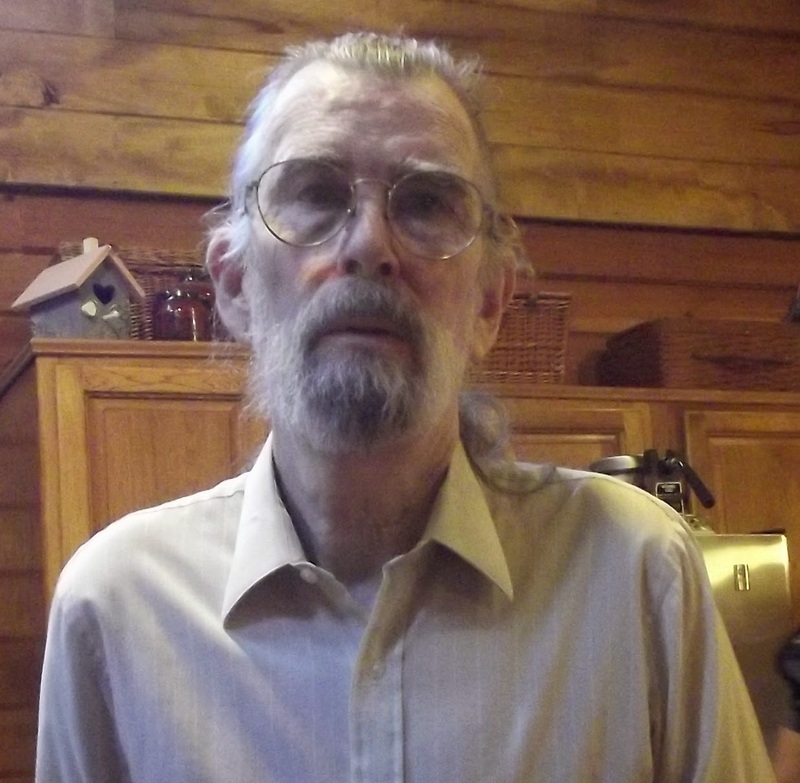 Unlike Calvert, Dan Post did get an obituary in ETCetera, written by founding editor Darryl Rehr. 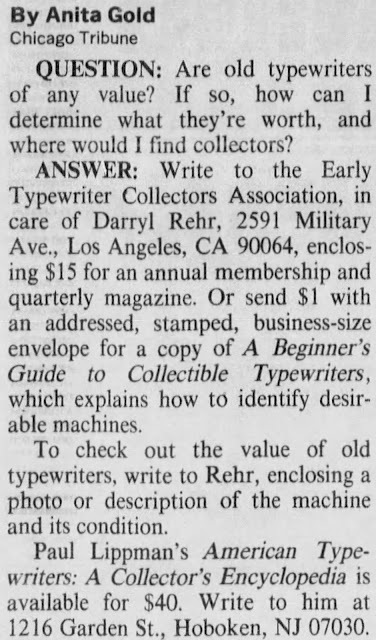 Unfortunately, Rehr did not not say when Post started collecting, just that it was "way back in the days when many years would need to pass for typewriters to become antiques". Presumably, then, it was before 1973. 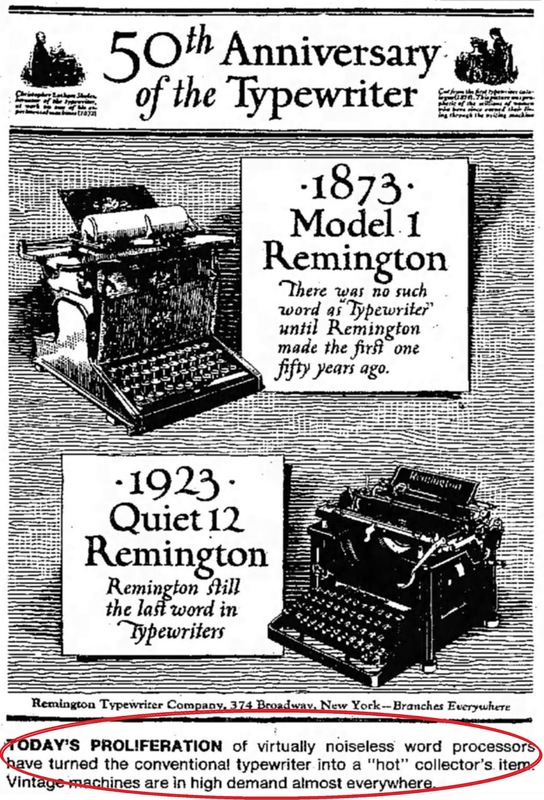 Post was certainly using typewriters from at least 1944, when he brought out the first of his custom car books, a replicated photo album including photos of typewritten copy. Rehr went on to say that Post had, with Typex, "helped lay the foundations for ETCetera" and that he was "the one who got us all together [Rehr's italics, not mine]. "He took what was once a ragged grapevine of tenuous pen pals [Calvert's list, perhaps?] and forged it into a bonafide network." Since Rehr suggested this was with the start of Typex, and Calvert gave Post his folder of contacts, perhaps Calvert deserved more credit than he received. But Rehr did say Post provided the "principal impetus" for the foundation of the ETCA. 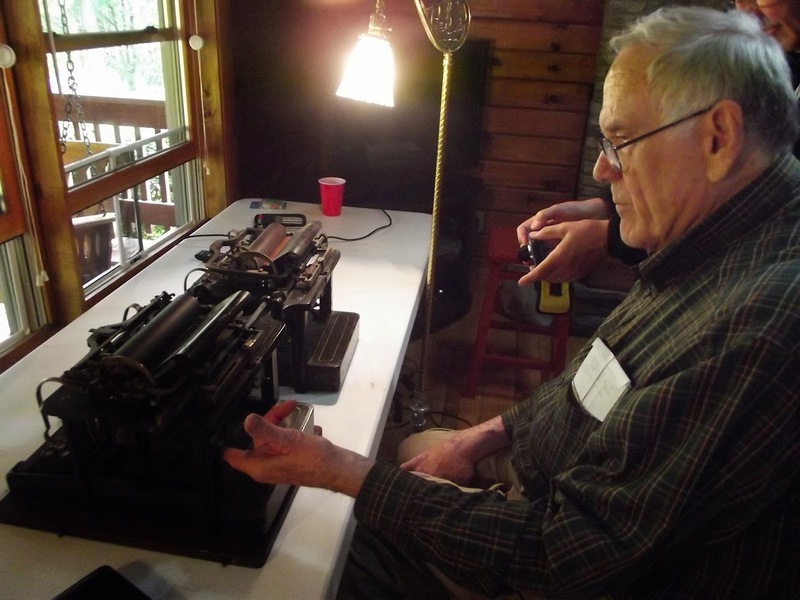 Ed Peters at his Old Typewriter Museum in New Holland, Pennsylvania. Three years after Typex first appeared, another typewriter collector had the idea of corresponding with a loose-knit community of collectors and to start a similar, associated newsletter. 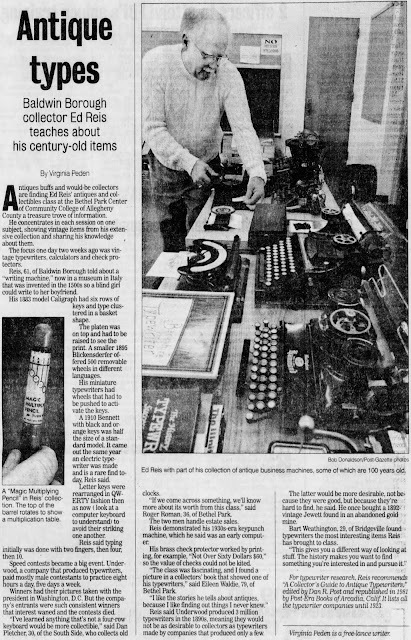 He was Leo Edward Peters Jr of the Old Typewriter Museum on East Conestoga Street, New Holland Pennsylvania, and the short-lived publication was called The Typewriter Collector (its first issue was called Typewriter Topics). Ed Peters was born in Charleston, West Virginia, on February 2, 1928, and educated at the University of West Virginia, Morgantown. He worked for newspapers and in public relations and advertising (for Sperry). 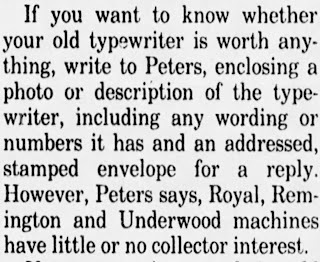 Peters began collecting typewriters in about 1972, after coming across an early Burroughs, and later an all-brass Underwood 5. 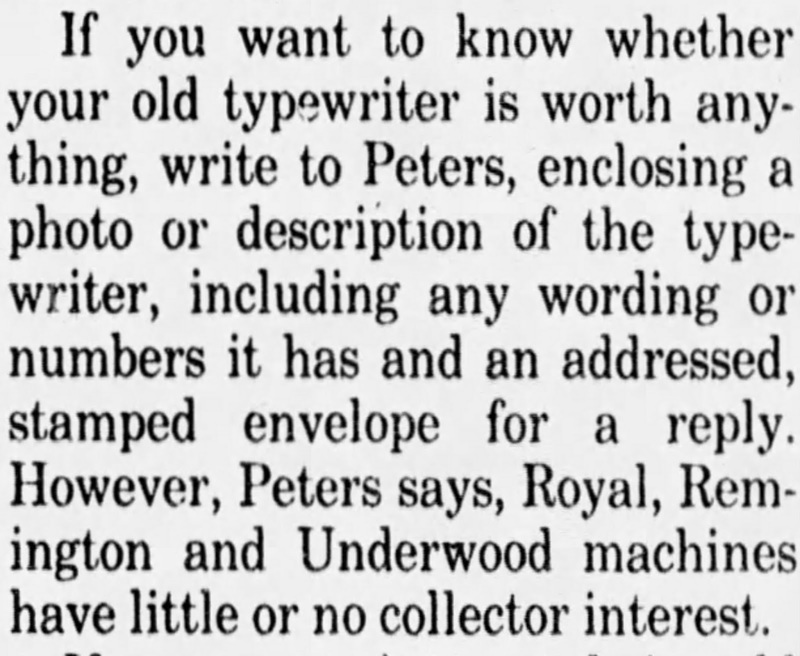 Before being advised himself by pioneering collector Dennis Clark, Peters had been "ripped off" by another collector, one "no longer in the hobby, fortunately" (Who could that have been, I wonder?). 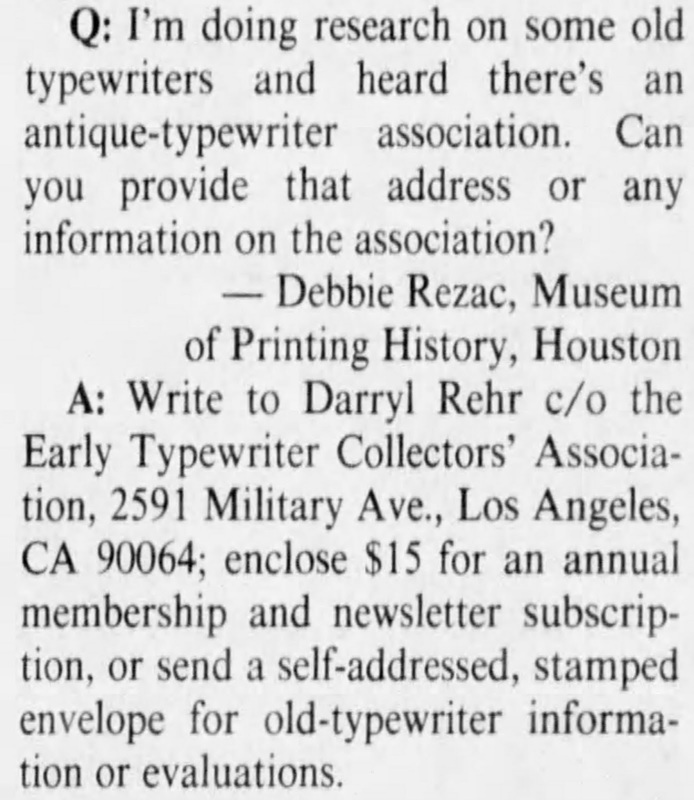 In December 1984 Peters wrote to fellow collectors suggesting ideas for his newsletter, which he envisaged as a way of publishing buy-sell-swap classifieds, more than 10 years before the advent of eBay. Peters died in New Holland, on May 10, 2006, aged 78. 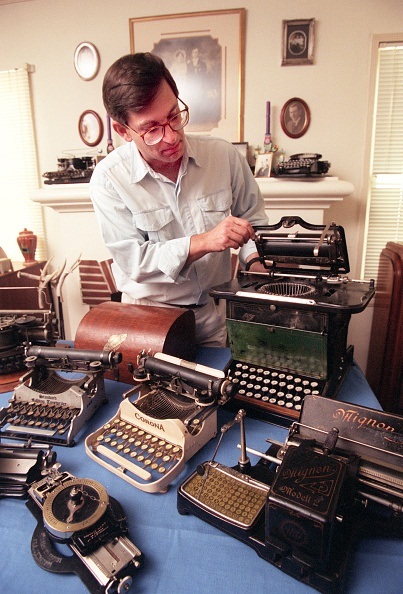 Some time before his death, Peters sold his entire collection to California typewriter collector Michael Harvey Street Brooks. Brooks, however, died in Berkeley, aged just 61, only three weeks after Peters had passed away. Brooks had battled cancer for many months, yet seemingly remained optimistic enough to secure the Peters collection. An avid collector of antiques, a lawyer and a journalist, Brooks also contributed to ETCetera. He was born in Detroit on October 26, 1944, and graduated from Oak Park High School in 1962. Brooks graduated from Michigan State University in 1966 with a degree in journalism. In 1968 he was inducted into the US Army and stationed in Germany. Brooks moved to the Bay Area in 1970 and studied law at Golden Gate University, earning a California State Bar degree in 1976. He had a passion for antiques, attending flea markets and antique fairs regularly, including Antiques by the Bay in Alameda on the first Sunday of every month. His collection of Statue of Liberty memorabilia, including an invitation to Liberty's opening, earned him the attention of the Wall Street Journal and several television shows. 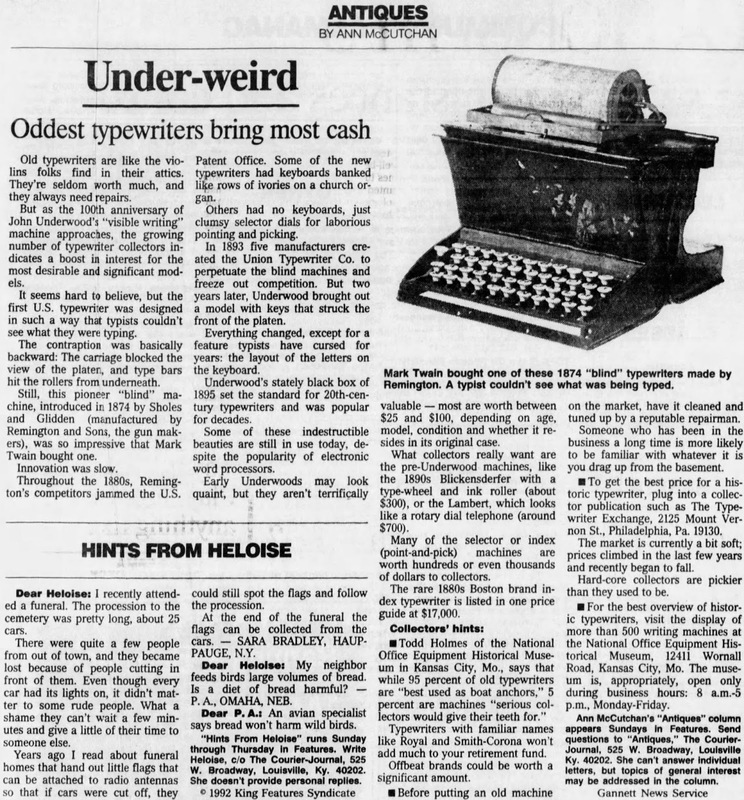 Mike Brooks and another typewriter aficionado, Cuyler Warnell “Ned” Brooks, were unrelated. Ned Brooks was born on February 8, 1938, in Glasgow, Montana, and spent his childhood in Chile. He died in Lilburn, Georgia, last August 31, aged 77, after falling from his roof while making repairs. 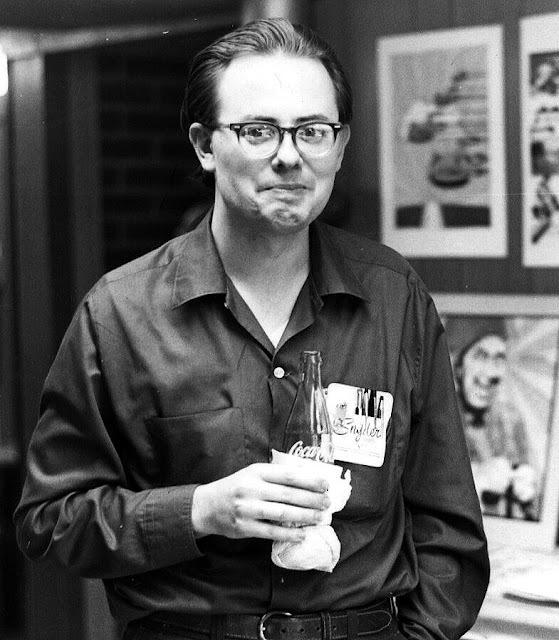 This Brooks was most famous as a co-founder of Slanapa (Slanderous Amateur Press Association) and as leading light in the science fiction fan group Southern Fandom Conference. 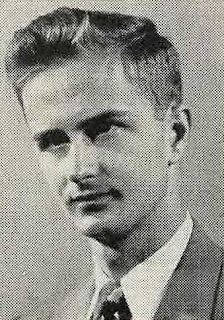 Brooks worked for 39 years as a NASA wind tunnel engineer at Hampton, Virginia, being hired after graduation with a degree in physics from Georgia Tech in 1959. Brooks published 28 bimonthly issues of It Comes in the Mail (1972-1978) and 36 issues of It Goes on the Shelf, which he started in 1985. 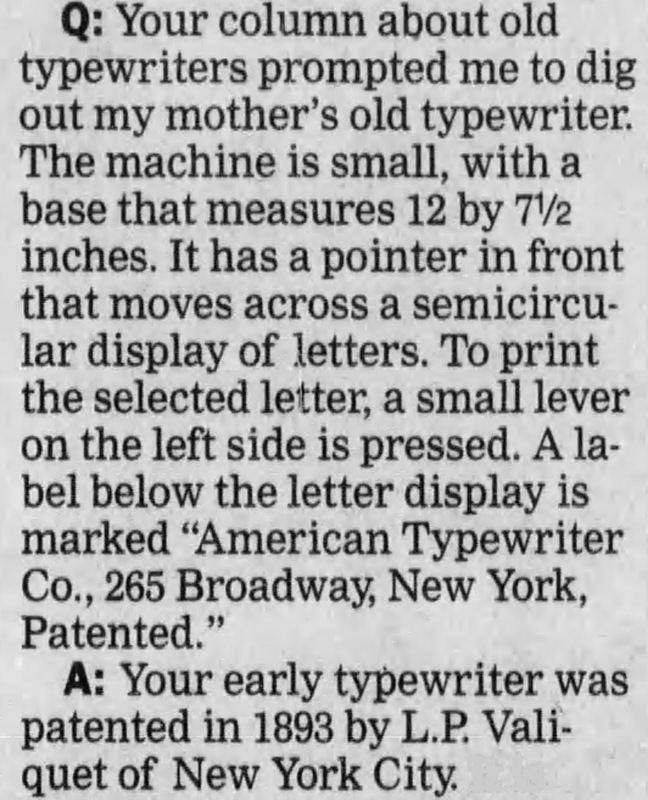 "It died of success," he said, "with only an electric typewriter and a mimeograph machine, I could not keep up - the larger the zine got, the more came in the mail." Brooks retired in 1998 and in Lilburn bought and arranged a large house with a separate room for his collection of more than 300 typewriters. 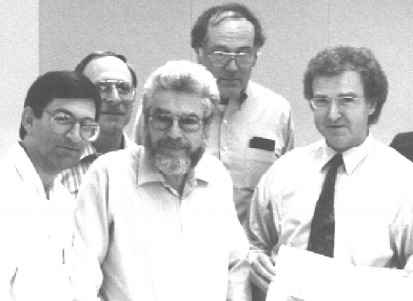 Darryl Rehr, Jay Respler, Paul Lippman, Jim Rauen and Uwe Breker in Kansas City in 1991. Paul Lippman had started collecting typewriters (his first was a Corona 3) in the early 1960s, when he was a copywriter for the award-winning advertising firm J. M. Mathes Inc in Greenwich Village. By running classified adverts in Hobbies Magazine, he soon amassed a large and very impressive number of rare machines. Among those he found was a Blickensderfer Electric, which Wilf Beeching twisted his arm to sell. He was also invited to look over some surplus machines for sale in the basement of the Milwaukee Public Museum (the Dietz Collection). By the late 1980s, however, his health had begun to deteriorate after he had suffered a stroke, and he began to sell off his collection. He kept one machine, a decorated Sholes & Glidden. 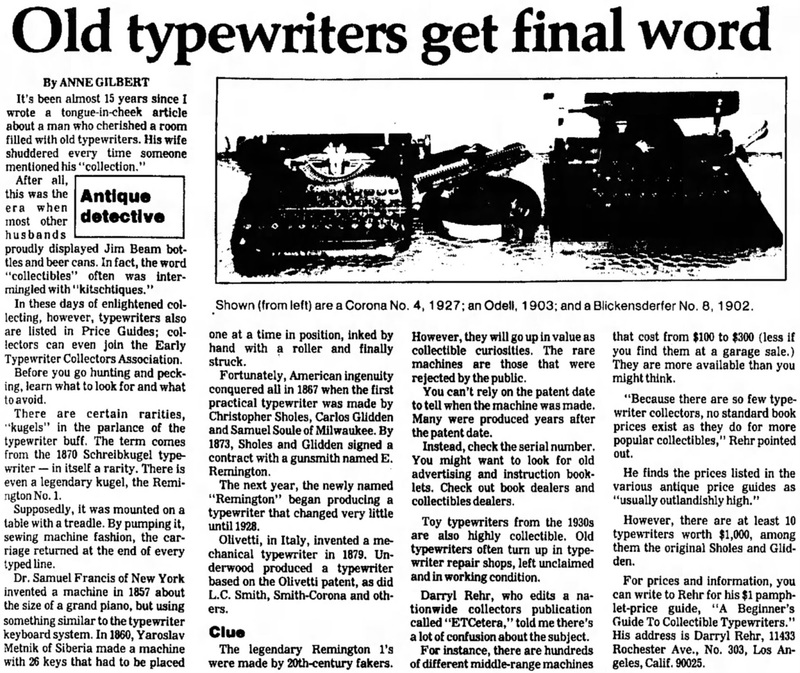 Lippman rescued the British journal Type-Writer Times, which had been started by Graham Forsdyke in 1985 but, after just 12 issues, had failed to find another British editor. As a result, the British group was renamed “Anglo-American”. 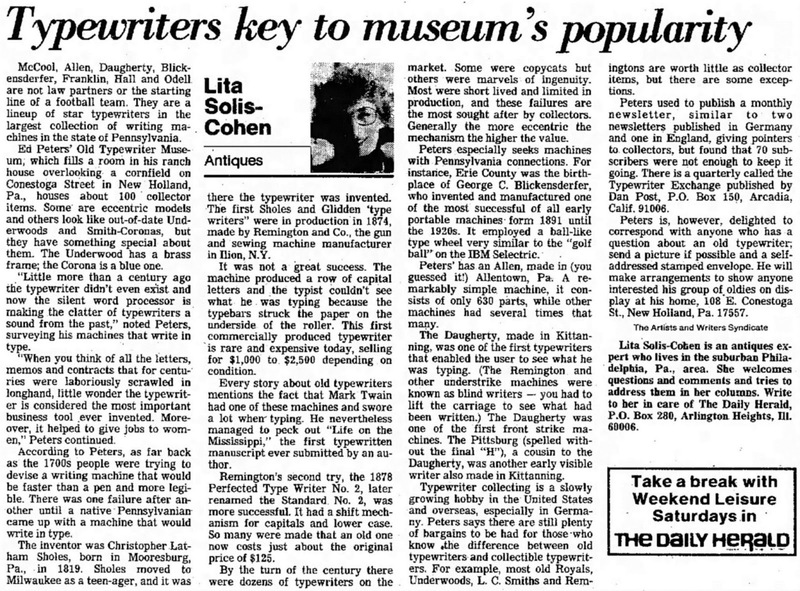 From 1991-93 Lippman also edited The Type Writer, a successor publication to Type-Writer Times. Lippman died of neurological problems in a New York hospital on April 3, 1995, aged just 66. A graduate of New York City public schools and New York University, he had been a Korean War veteran, a cartoonist and an editor of Hoboken History magazine. 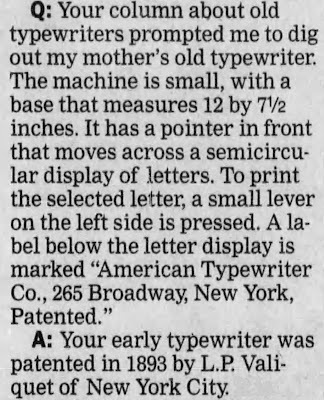 Donald Scott Sutherland, born in Harlem on January 21, 1944, and a graduate from the Manhattan High School of Music and Art, knew the precise moment his passion for collecting typewriters started. It was on December 8, 1968, when he went looking for a ribbon retaining screw for a L.C. Smith 8 that a friend had given him for helping him move. Sutherland chanced upon a typewriter repair shop called the All Language Typewriter Company. He found there for $25 a Hammond Multiplex with reversible carriage and open frame, spending his grocery money on the machine. It was, he said, "the beginning of the end". "I wanted to rescue all the fascinating gizmos I could find!" 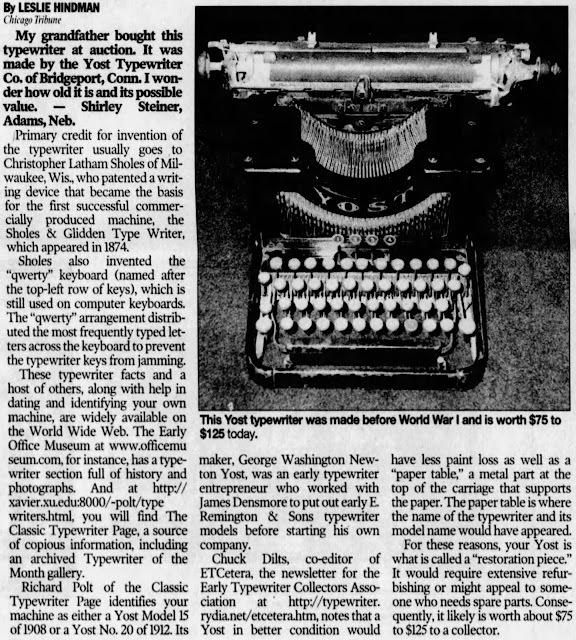 Of the 750 typewriters he did find, he was "most partial" to a Wagner-Underwood experimental model and a W.J. Hull, and his favourite was a Caligraph 1. As far back as September 2000, Sutherland made very accurate predictions about the impact of eBay on skyrocketing prices for typewriters, including the Olivetti Valentine. Sutherland died of cancer, aged 66, at his home in New Brighton, on May 24, 2010. Another in that upper echelon of collectors with Clark is Californian James J. "Jim" Rauen (below, 1935-), who developed an interest in typewriters when he was teaching at Little Rock, Arkansas, in the early 1960s and started collecting them some years after that. His first "unusual" find was a Smith Premier No 2 in the mid-70s. His collection also grew to almost 700 machines, including 13 Sholes & Gliddens, as well as a large number of early Remingtons, Blickensderfers and a Royal Grand. Michael Hugo Adler, below, was born in Prague, Czechoslovakia, on September 20, 1934, and grew up in Australia, where he studied music at the Sydney Conservatorium. From 1956 Adler backpacked around South America before settling in Caracas, Venezuela, and working as a journalist and foreign correspondent. 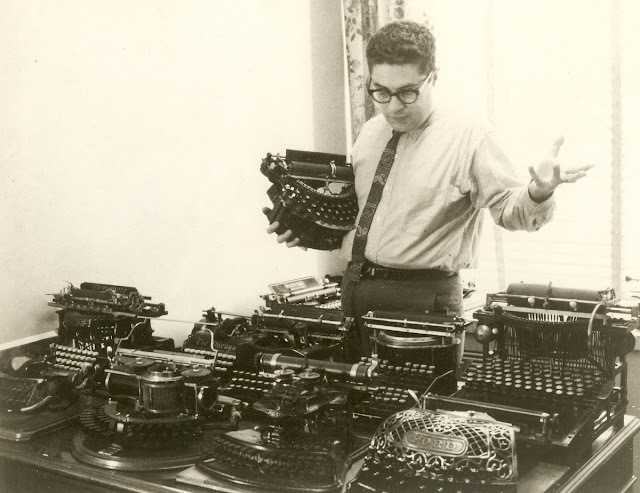 Adler moved to Rome, Italy, in 1967, where his interest in collecting typewriters was sparked by finding a Frolio 7 index machine at the Porta Portese flea market - he paid 100 lira for it. Adler, 81, now lives in East Sussex in England. In 1973 Adler published The Writing Machine, the most complete history of typewriters written in 50 years - putting to one side Bruce Bliven's 1954 The Wonderful Writing Machine, which, as a history, was notoriously incomplete, and Richard Current's The Typewriter (republished by Post in 1988), which was extremely accurate but concentrated on the Sholes & Glidden. 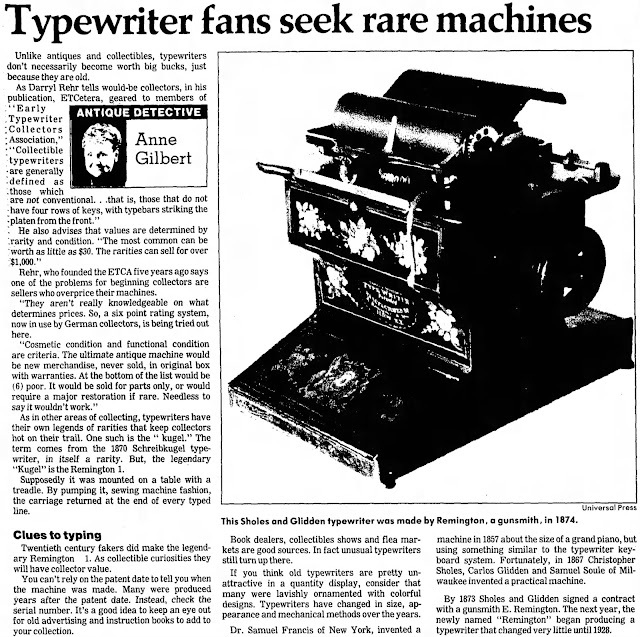 In 1997 Adler and Rehr published books, both titled Antique Typewriters, in which an attempt was made to put an approximate price on various vintage machines. In almost every case, these speculated figures were outdated even before the ink had dried on the pages. The publication of these two books, however, reflected a growing interest in the value of old typewriters which had already been well fostered over a period of 24 years by syndicated antiques and auctions newspaper columns. Darryl Charles Rehr was born in California on July 31, 1950. In the 1970s, as a journalist, he bought himself a 1911 Royal No 5 and a 1908 Remington No 10 - not as collectibles, but to use. In 1984 he started collecting typewriters. 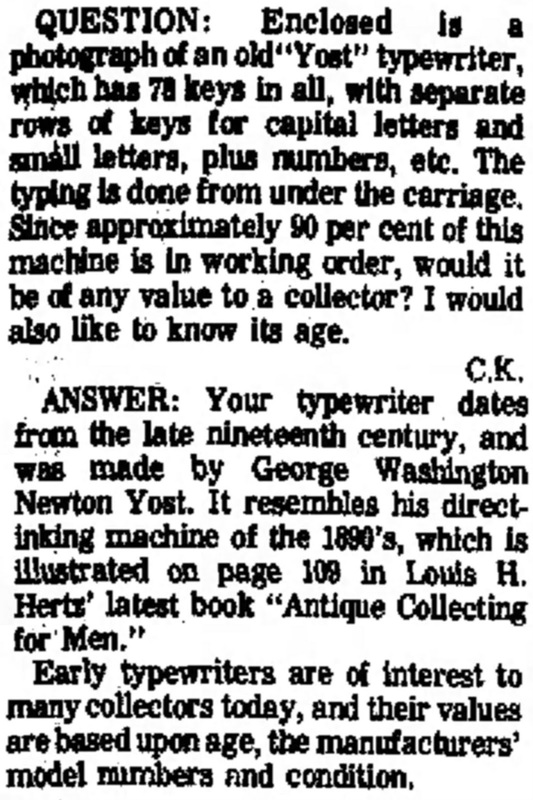 He also began to write about typewriters, his first article appearing in Antiques and Collectables in 1986. 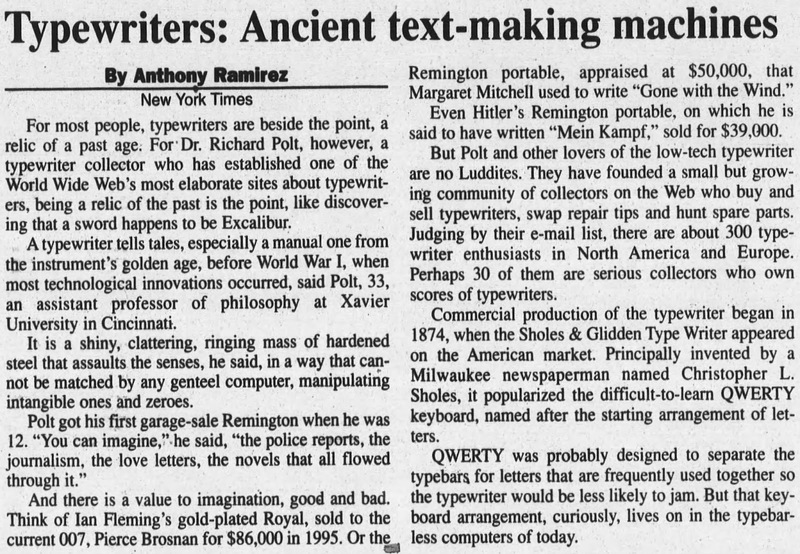 He also wrote for Popular Mechanics, The Pittsburgh Press, Antique Trader Weekly, Pennsylvania Magazine, The Office Magazine, Business Electronics Dealer and Spokesman (National Office Machine Dealers' Association). 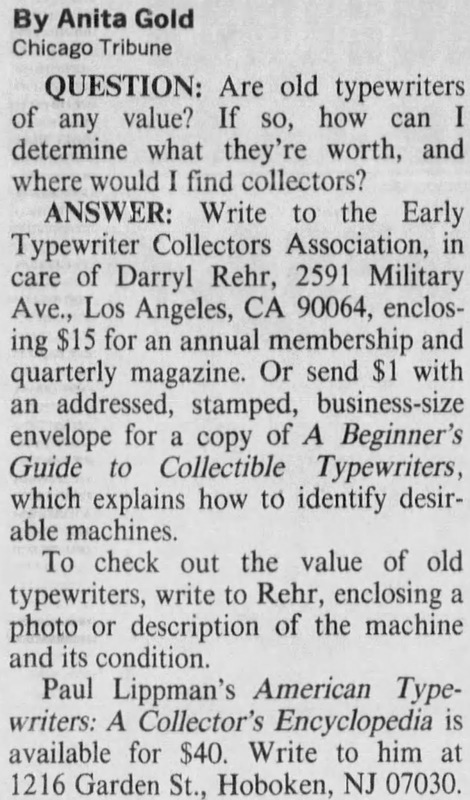 In 1987 Rehr was one of the founders of the Early Typewriter Collectors' Association and was the founding editor of ETCetera. 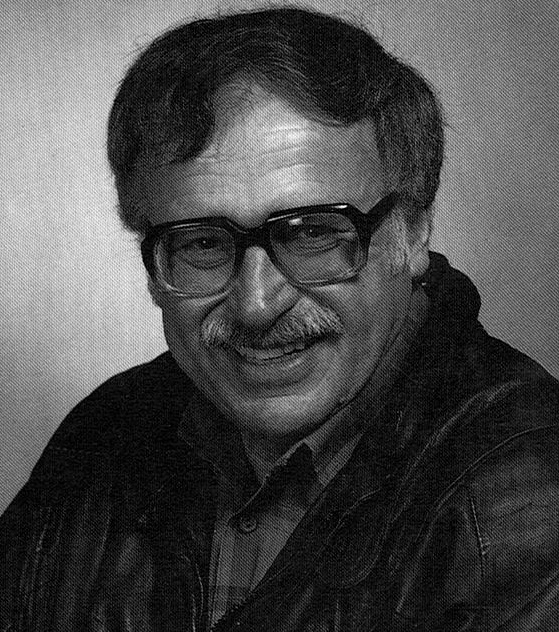 He edited the first 49 editions, from October 1987 to December 1999 (Nos 1 to 49). 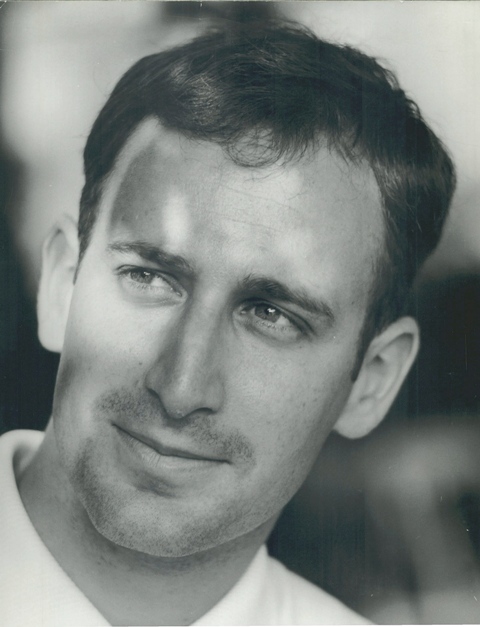 From 2000 Rehr has concentrated on his career in movie and television producing, directing and writing. 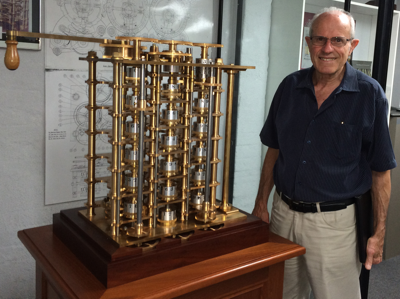 In Australia, early collectors included Bob Moran of Precision Dynamics, Mona Vale, Sydney (below), the late Bruce Beard of Western Australia, and Richard Amery, a former New South Wales parliamentarian, of Rooty Hill, Sydney. FOOTNOTE: My thanks to Mike Brown for his help with this article. Nice to know about all the past as well as present collectors. Now I've got to get to work and travel the country to see if I can get 700. Oh, I wish. Mrs. M complains about my 73. 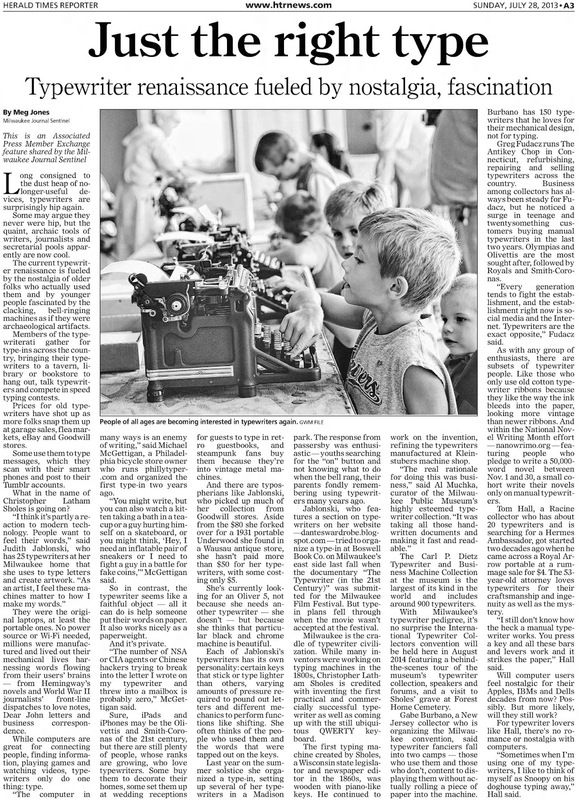 Excellent research on the history of our hobby. I am saving these posts! This was a nice surprise to find when I "Googled" my brother's name (Michael Brooks) and the word collector after it. Thank you; he's smiling. Thank you so much, Robert! Super interesting and excellent research!